From December 15-23, many children from the sectors belonging to the parish of Our Lady of Loreto, Guayaquil (Ecuador), participated in the Christmas Novena, "Las Posadas". 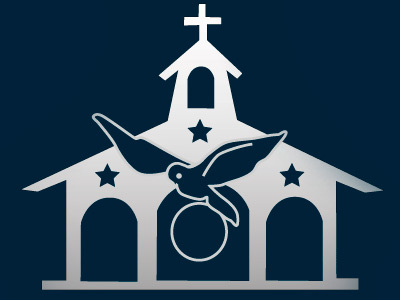 On December 22, all the children came for the Holy Mass at 6 p.m. to do the Novena in the Church. At the end of the Mass, the children went up to the Nativity Scene to sing to God, who was going to be born in the stable. Many of the children came dressed as kings, shepherds, Saint Joseph, Mary, or angels. 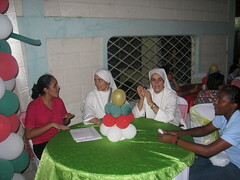 We also had a Christmas dinner after the Holy Mass for the members of different groups that form a part of the parish. It began with a living Nativity Scene, which the youth, the choir and the sacristans acted out. The youth and the altar servers of the parish served dinner for everyone. 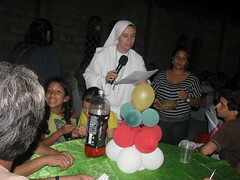 After dinner, Sister Clare began the Christmas game with questions about the catechism and riddles. She went around to each table to ask the questions. The winners received white hearts, a symbol of a pure heart in which God can be born this Christmas. In the end, everyone won the white hearts. We hope that our hearts are always pure and that God can be born daily in them. At the end of the game, we began singing Christmas songs to the Child Jesus and a atmosphere of family and of joy filled the room. Everyone who knew how to play the guitar and sing participated in the carols. The Servant Brothers also went up to sing a Christmas song in English. To finish off the celebration, there was a gift exchange. 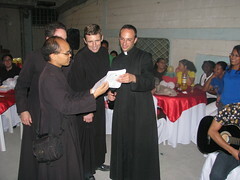 The parish priest, Father Reinhard, gave out a gift to every one, showing his thankfulness for the collaboration in the parish and entrusting to them the work of the coming year 2013. 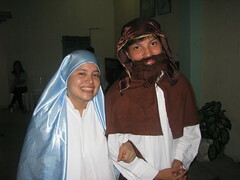 See the Photo Album of "Las Posadas"